Jessica Phillips and family present the Tony Phillips Memorial trophy to Myra Landsburgh, Michael Humphreys and Peter Leaton following the annual tournament at the City of Peterborough club. 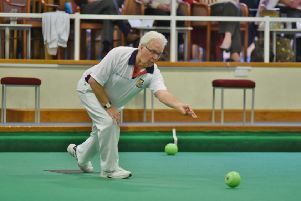 Whittlesey Manor have reached the third round of the Bowls England National Club two fours competition by winning two matches in the space of 48 hours, defeating Parkway B 48-22 and Warboys A 39-35. They now await the winners of the match between St Ives and Brampton. Shotbowl's Trevor Collins presents a shield he donated in memory of Federation stalwart John Dickenson to John's widow Mary before a match between Whittlesey Manor and the Northants Bowling Federation. Also in the presentation party are Whittlesey Manor president Martin Welsford, county president Tony Mace and Mary's daughter and husband, Sarah and Simon Goundry. Defending champion Norma Squires (City of Peterborough) was beaten 21-16 by Wendy Stevens (Peterborough & District) in the opening round of the Northants Women’s Bowling Federation senior singles championship. Preliminary round: Wendy Stevens (Peterborough & District) bt Norma Squires (City of Peterborough) 21-16; Wendy Harrold (Whittlesey Manor) bt Pat Collicott (Deeping) 21-13; Veina Slater (Crowland) bt Val Du’Kett (Ketton) 21-17; Sheila Craig (Conservative) bt Fiona Richardson (City of Peterborough) 21-10; Chris Ford (Ketton) bt Joan Robinson (Yaxley) 21-14; Shirley Suffling (Ketton) bt Jean Kendall (City of Peterborough) 21-10; Julie Masters (Parkway) bt Hazel Bass (Yaxley) 21-20; Kath Browning (Yaxley) bt Elizabeth Wallace (Stamford) 21-18. In the second staging of the Championship Challenge between the winners of the Peterborough and Spalding leagues, it was Spalding-based Ayscoughfee who retained the trophy following a 60-52 defeat of Parkway A at Market Deeping. Last season's Peterborough League champions Parkway who were beaten by their Spalding League counterparts Ayscoughfee in the Championship Challenge at Market Deeping: (Back row, left to right) ' Brian Martin, Trevor Collins, Neil Wright, Paul Dalliday, Ean Morton. (Front) ' Howard Shipp, Tristan Morton, Fred Addy, Mike Robertson. A new trophy was dedicated at the weekend to the memory of John Dickenson, a distinguished servant to both the English Bowling Federation, with whom he served as president and chairman, and the Northants Bowling Federation, where he held a number of administrative posts over many years. His widow Mary, together with her daughter and husband, Sarah and Simon Goundry, were at Whittlesey Manor to see the shield, donated by Shotbowl’s Trevor Collins, competed for between the host club, where John began his long association with bowls, and a Northants Bowling Federation team led by county president Tony Mace. Whittlesey Manor took the inaugural honours by forty shots, winning on five of the six rinks, with Mrs Dickenson presenting the shield to home captain and club president Martin Welsford. Local bowler Chloe Brett, daughter of world number two Nicky, has been selected to represent the England indoor under 18 team in the British Isles championship at Bristol in October. The City of Peterborough club staged their annual Tony Phillips Memorial drawn triples tournament at the weekend and the winners were Myra Landsburgh, Michael Humphreys and Peter Leaton.